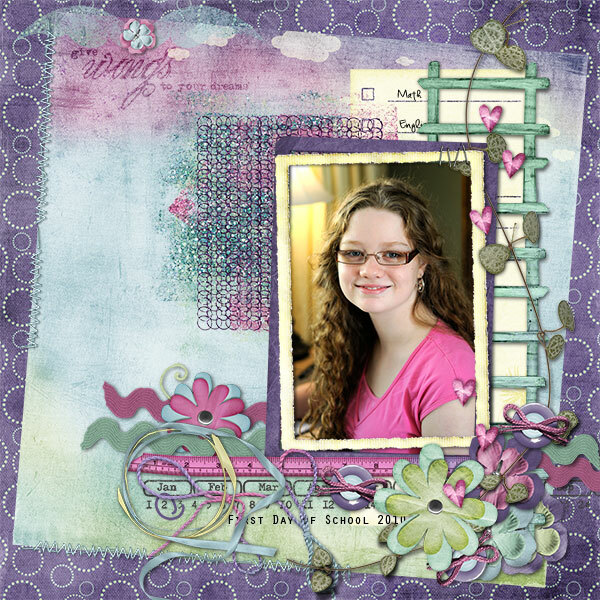 I just couldn’t resist using the gorgeous Valentines Retrospect from Quirky Twerp for another layout. This one is for the Log Your Memory week #4 challenge. This week the prompt is to journal or list a project you wish to work on the year. I considered tying this in to my one little word and making me the project – but instead picked something I have really wanted to tackle for a while. My box of unfinished quilts, block swaps and purchased mini quilt kits has been calling out for some attention. The little paper scrapping hobby kind of took over and my quilting took a back seat. With balance being my aim I have a few things to accomplish by dealing with the tub of fabric. Using what I have for my creativity, clearing out the stuff in the house, thereby creating more space and less clutter allowing my mental process some relief. Balance between starting and finishing. Isn’t that balance word a good one? The layout is quilt like, and lists the process I will use to deal with the contents of my UFO box. The good news – I can tick off some things on that list and started putting one quilt top together last night. It’s been nice after all the festivities to slow down this week. The decorations are now away and all the leftover baking just about consumed. This layout is with a couple of new releases at The Digi Chick for this week. My youngest took this photo of me, a rare one :), on Christmas day. It’s unusual for me to show photo’s of myself and yet it is something I know I need to do more of. Especially for my children’ss sake down the track. We do have some past times when there is not even a photo documenting me as being there. That needs to change. Along with a few other things. This year has been quite a big one for me in terms of understanding who I am, how I feel and where I fit. It is a slow process but one that is moving in a positive direction. This layout is a reminder to me of where I want to head – and the things I want to continue to work on. The layout is a little out of my usual style but fun to create none the less. Something else I want to do more of – try new ideas and styles. It kind of suits the photo! 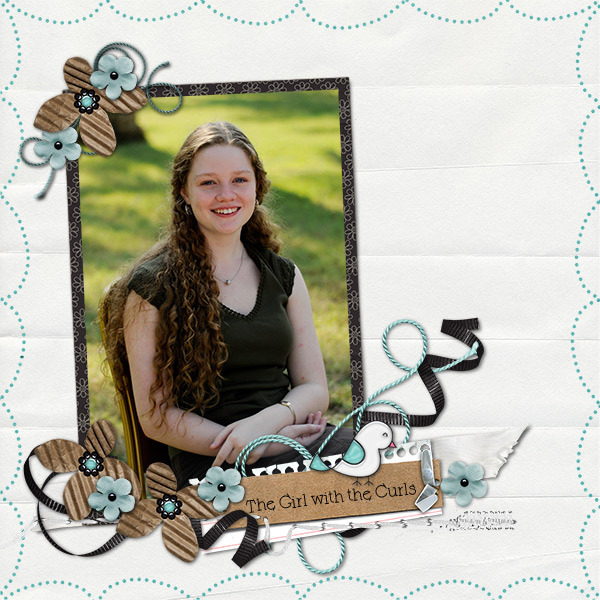 The design is from December Simple Template Set by Kellie Mize and the kit is a fun one called Fresh Start by Jennifer Fox and Amy Stoffel. I am not sure there will be any more posts from me this year so I wish you, and yours, a wonderful New Year. May you be blessed with fabulous health and all you could want 2011 to bring. Creative Team work to date. 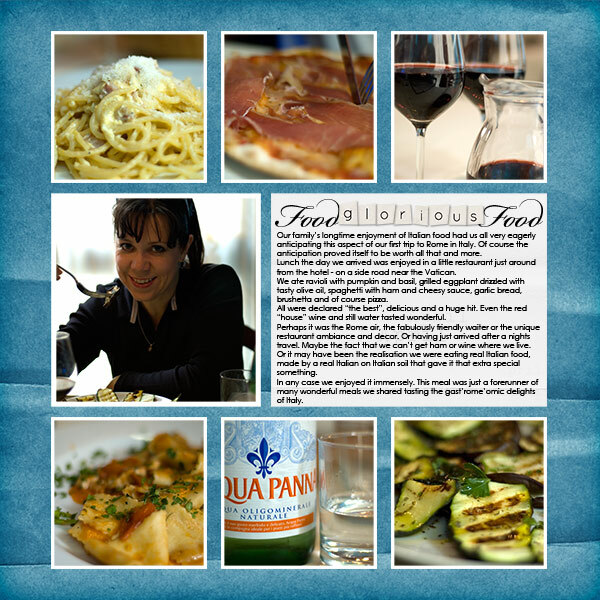 All Digital products used in these layouts are from The Digi Chick. For full credits and a closer look please visit my layout gallery over there as well. Two layouts recording some fun moments on our fabulous Rome Trip last year. Of course we had to eat authentic Italian Pizza! 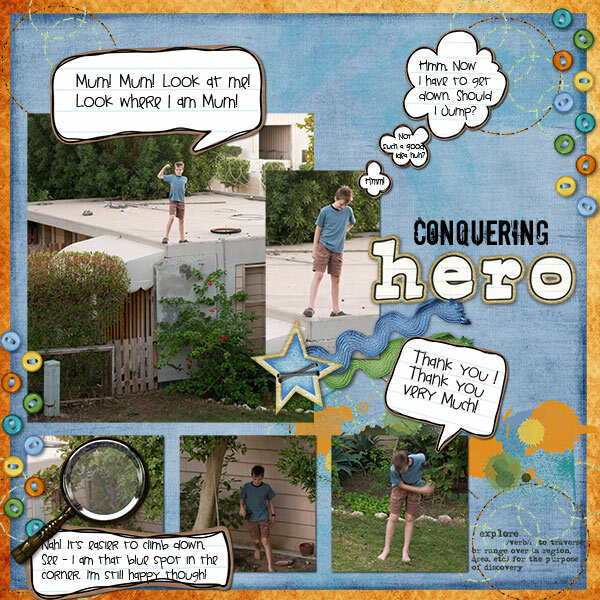 I just had to scrap these photo’s and Brenda Kempf’s wk 3 sketch challenge at Scrapbook bytes was perfect for them. We were mooching around this great new mall in Doha called Villagio. My youngest munchkin was sitting on my lap while I tried to enjoy a half cold cup of coffee (yes we have Starbucks here too) and one of the children had the camera. It is unusual for me to be in photo’s let alone caught candidly. We were just chatting, mucking around, and at one point I held her face to let the photo be taken with her being still. You can imagine my surprise when I downloaded the photo’s to the PC and there she is in the next shot holding her own face, She really is a crack up and so much fun. 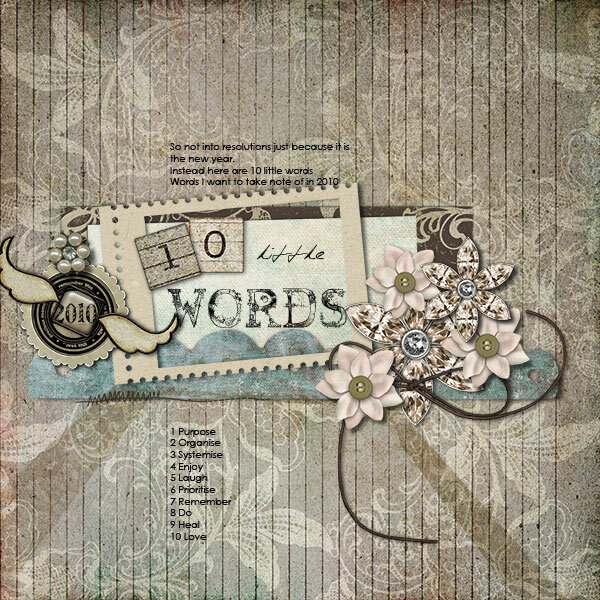 The Green Tea kit I have used from LaWanna Desjardin is gorgeous and has so many nice touches in the elements..It’s a shame I couldn’t use them all. You can find the layout credits here. Inside this mall is like a little Venice. All the shop fronts look like houses with the upstairs balconies, open windows and flowerpots. The ceiling is even painted to look like a blue sky with soft white clouds drifting across it, curved down at the edges to fade away behind the roof lines of all the stores. The main attraction would have to be the little canal, complete with gondola’s maneuvered by traditionally dressed gondoliers, these being serenaded from the sides of the canal by strumming guitarists. The canal wanders through a lovely area of the mall and there are even little steps up and over bridges so you can move easily from store to store. It is a quiet, serene, very pleasant atmosphere. If you want some noise then head around to another part of the mall. On the way we passed through the echo dome where the dome roof is painted like a night sky with twinkling stars and the munchkins wanted to stay and “echo” all day. Headed to where they have a huge food court and restaurant area. Chai Tea, TGIF, various other places and your usual fast food outlets can be found here. Smack bang in the middle of this area is an ice skating and hockey rink. All set up with score boards and lines marked. It was extra cold in there so it should be a good place to escape the summer heat. Situated right next to the site of the 2006 Asia games, I am sure it will be a great attraction. What an awesome week we had. You might want to grab a cuppa to make it through this post. Thursday saw us arrive and catch up with our friends. Another lot of friends had arrived from Dubai for the weekend as well, so we all went to dinner at the Marriott. It was a buffet – so the munchkins were in bliss, choosing their favourite foods, going back for more, having deserts before and after main course!! This unusual freedom kept them happy and allowed us to relax and chat for hours. It is an unknown when we will see either of these friends and so it was really special to share this time with them. Friday up early and try to find the pool. We were going on word of mouth directions. Maps are not real up to date or accurate, not many roads have their names sign posted either, so it took a bit but we found it. A beautiful facility, with everything a swimmer could want. Yes! The looks on the munchkins faces was priceless…exclamations of “boy! that’s a long pool” and “how am I going to swim that far?” were uttered. Warm ups soon showed them they could. 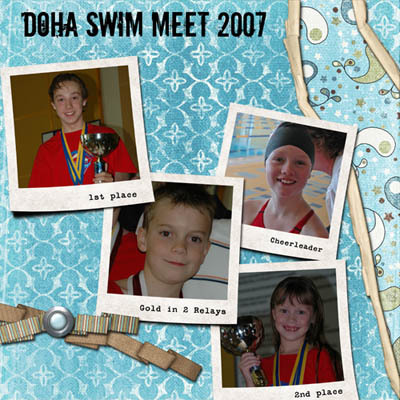 They all swam very well, medals were earned, personal best times were broken and a fun day was had by all. Lunch, which was salad, humus, tabbouleh, other entre’s, a couple of choices of mains, deserts as well as fruit or fruit salad, was also provided – and it was incredible, very tasty and well prepared. Usually the children don’t eat much when competing however it seemed to make no difference as they all ate well. We went out again to eat in the evening. This time to an Italian resturant called Il Rustico at Rydges. The food was lovely. Most enjoyable was the fresh baked bread and whole baked garlic cloves they brought to the table with balsamic vinegar and olive oil..choose a bit of everything, mix it up on your plate and dip the bread – YUMM!! Then it was farewell to our friends from Dubai. Saturday was the same routine with the swimming. Two of the munchkins did well, ranking in the top two places overall. Our team also ranked top! We spent most of the next day recovering, and a little time driving around Doha. It is very hot there as well and not much fun in the dust and humidity for sight seeing. Most of my photos are taken out of the car window. The rest of the week was very relaxing, visiting a couple of malls (only place out of the heat), going out to eat for hubby’s birthday and sharing with the friends we were staying with. 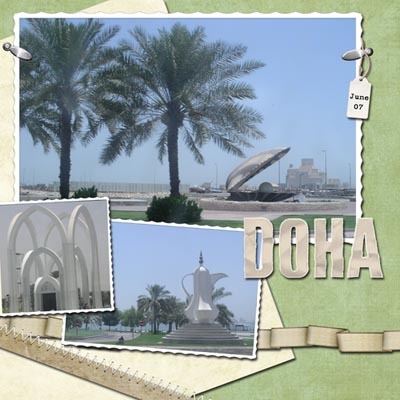 Doha is around a bay and quite pretty – when they have finished the 125+ towers they are constructing it will be much easier to navigate and enjoy… roads may be open in the morning, then closed and ripped up by evening due to massive road work and reconstruction going on there as well. Some issues with our car cooling system thermostat kept us there a day extra, however our drive home was uneventful and quicker than the way down when we encountered a lot of sand storms and high winds. Our A/c stopped working for half the way down. This was pretty hard to take in the 45+ celcius heat of the desert. Being home is always nice..it’s amazing how much you appreciate what you have when you have been away from it for a little while. So that’s it. I will post more layouts and photos over the coming week or so. Hope you enjoyed your cuppa!